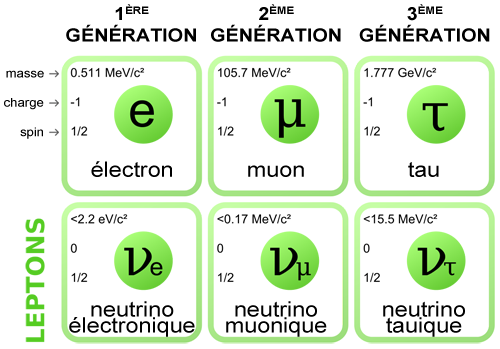 The leptons are a family of elementary particles that have characteristic properties. They have a value of quantum angular momentum, known as spin that is always a 1/2 integer value. They also have an electric charge (minus for normal matter leptons and positive for anti-matter leptons). Leptons are not effected by the strong nuclear force so are not bound to atomic nuclei in the way Up and Down quarks can be. The most familiar of the leptons is the electron. The electron is common and is bound to atoms through its electromagnetic attraction to the positive charge in the nucleus. There are two heavier versions of leptons called the muon and the tau. The muon and tau are considered electron-like neutrinos, since they are identical to electrons in every way except for their mass. In contrast to the electron-like leptons, there are neutral-leptons called neutrinos. They come in different varieties and there is one variety associated with the electron, muon, and tau. The neutrinos are very light, having such a small mass that they have been very difficult to measure until recently. The neutrinos do not have an electric charge (hence neutral-leptons) and so interact with matter very rarely since they have no interaction through electromagnetic or strong forces, and barely register through the gravitational force. They can interact through the weak nuclear force. It is estimated that there are billions of neutrinos zipping through every square centimeter of your body every second of your life. You don’t notice them because there interaction with matter is so weak.